Want to try out the Mac operating system, but don’t want to purchase Apple hardware? 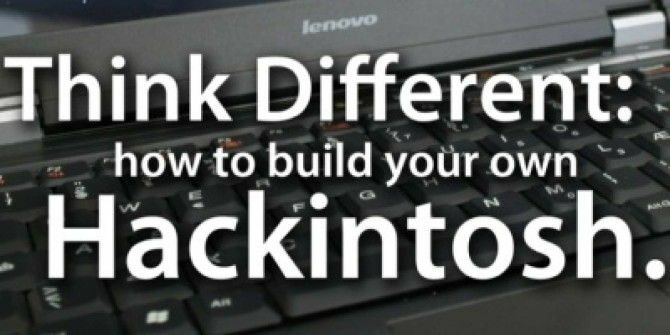 Check out “Think Different: How to Build Your Own Hackintosh”, the latest guide from MakeUseOf. By author Stefan Neagu, this how to Hackintosh guide outlines what you need to do in order to build a power PC Hackintosh. Whether you want to try using a computer you already have or buy a pre-built computer for the job, this guide shows you the way. This guide is available to download as a free PDF. Download How To Build Your Own Hackintosh now. Feel free to copy and share this with your friends and family. A Hackintosh PC, as the name would suggest, is a vanilla PC (built by you or a retailer other than Apple) running a hacked (or patched) version of Apple’s Mac OS X operating system. OS X is specifically designed to run on Apple’s hardware line; a Hackintosh is simply non-Apple hardware using the operating system. Although Apple opposes the practice of hijacking their OS for use on off-brand PCs, many technology-oriented people who don’t want to buy the hardware from Apple choose to spend a lot of time and effort in creating a Hackintosh. It’s not easy by any means, but this guide explains to you what’s needed to get OS X running without a Mac. 1. Apple offers just a few hardware configurations for each of the form factors – desktop (iMac & Mac Mini), laptop (MacBook and MacBook Pro), and workstation (Mac Pro). Many long-time PC users are accustomed to being able to choose and customize every specific aspect about hardware, options that are not in Apple’s offerings. 2. Upgrading and customization of Apple hardware is world-renowned for having obscenely high prices. Upgrading from 4GB of RAM to 8GB of RAM in the Apple Store costs as much as $200 whereas on Newegg.com the same upgrade costs $40-$50. 3. Independent movie editors build high-powered machines for a fraction of the cost of a Mac Pro in order to use editing tools like Adobe’s Premiere Pro or Final Cut. Professional photographers will do the same for tools like Aperture; video, graphics and design people for Avid’s Pro Tools and musicians do it for Ableton Live and Logic Studio. 4. Rebels – there are people who will build a Hackintosh because they like the OS,but hate he closed-source nature of it and the monolithic, controlling ways of Apple Inc. They build their own Macs to make a point. 5. Many feel OS X is the best user interface on earth, but for the above reasons don’t want Apple hardware. Therefore, Hackintosh. Apple doesn’t actually employ protection methods that would deter would-be hackers from installing its software on unsupported hardware. Instead the design, elegance and efficiency of the OS prevents them from easily using other hardware. There are a number of hardware standards that Apple employs in its products that are not used by PCs: the GUID partition table, integrated TPM (Trusted Platform Module) chip and a small specific array of hardware drivers. They also have deals with hardware manufacturers to provide special, customized versions of their components for use just in Apple computers. Hardware manufacturers don’t write drivers for these components for other platforms like Linux and Windows and you can’t buy them at a store. It is possible, however, to build a Hackintosh by carefully selecting components that match or resemble those in Apple computers, doctoring configuration files and praying the next software update won’t botch the kernel headers, turning your PC into an inefficient heater for your room. Legal Disclaimer: This guide exists for educational purposes only. The author of this guide and/ or MakeUseOf.com DO NOT ACCEPT ANY RESPONSIBILITY EITHER LEGAL OR OTHERWISE if you choose to follow instructions provided in this guide. Proceeding further constitutes felony copyright infringement, intentional misuse of protected software or computers, felony import and usage of encryption technology and other federal, state, or country laws. IN NO EVENT SHALL THE COPYRIGHT OWNER OR CONTRIBUTORS BE LIABLE FOR ANY DIRECT, INDIRECT, INCIDENTAL, SPECIAL, EXEMPLARY, OR CONSEQUENTIAL DAMAGES (INCLUDING, BUT NOT LIMITED TO, PROCUREMENT OF SUBSTITUTE GOODS OR SERVICES; LOSS OF USE, DATA, OR PROFITS; OR BUSINESS INTERRUPTION) HOWEVER CAUSED AND ON ANY THEORY OF LIABILITY, WHETHER IN CONTRACT, STRICT LIABILITY, OR TORT (INCLUDING NEGLIGENCE OR OTHERWISE) ARISING IN ANY WAY OUT OF THE USE OF THIS GUIDE, EVEN IF ADVISED OF THE POSSIBILITY OF SUCH DAMAGE. The author of this guide and/or MakeUseOf.com do not offer legal advice. Consult your lawyer before proceeding further. If you do not agree with any or all parts of this Legal Disclaimer close this Guide and ERASE any/all printed or electronically stored versions of this Guide. Isn’t this warning a bit over-the-top? Of course provide a warning and legal disclaimer, but this is a bit too much and too complicated. I want it slimmed down a bit and written in easier to understand, less scarier language. If you want me to write it, let me know. In order to install OS X on your Intel computer, the CPU (central processing unit or processor) needs to support at least the SSE2 extension, although SSE3 is preferred. You can find out if your processor supports this extension by visiting the manufacturer’s website and looking at the technical specification sheet. If you don’t know the model number for your CPU, open Device Manager from the Control Panel and scroll down to the “Processor” listing. Alternatively, you can download a small free program called CPU-Z, which reads the capabilities of your processor and displays the information. If you’re using a Linux distribution, open the Terminal and type “cat /proc/cpuinfo”, then press Enter. Most if not all processors currently being sold support these extensions, but this step is necessary if you’re planning on using a machine you already own instead of building the Hackintosh from scratch. This guide will show you how to install Mac OS X on an Intel-based PC. If you’re planning on installing OS X on a PC you already own that has an AMD processor, I tip my hat to you. I spent three days trying to install OS X 10.6.8 on an AMD laptop I borrowed for this project. When I finally managed to get it “running” (no sound, no wireless and non-native display resolution) I botched it somehow – creating a Kernel panic every time I tried to boot it up. *Minimum and recommended system components are not official recommendations by Apple, but the personal opinion of the author. Not all features will work OOB (out of the box) in either configuration. If your PC meets the minimum criteria (RAM, hard drive and CPU columns) in the table above and you’d rather use that than build a new machine, it is possible that Mac OS X will work, but there are no guarantees. The hardware compatibility list is very narrow; wireless and sound drivers will give you many joyous hours of research on Hackintosh forums. This is because Apple uses customized hardware that is not available to end-users for purchase at stores like Newegg and Amazon. Above, a screenshot of Mac OS X Snow Leopard running the Finder, Mail and QuickTime. Depending on the purpose of your Hackintosh, you will have to choose a CPU, motherboard, graphics card and so on. There’s really no point in 8GB of RAM and dual HD 2600 PRO if you’re going to use your Hackintosh for surfing the web and checking email. The Hackintosh community is not centralized by any means, which means there are numerous wikis, guides, and hardware compatibility lists. I recommend you visit each one of these sites, and pick from the lists given, the hardware that is closest to your needs. You need to familiarize yourself with the technical specifications of the listed hardware in order to make an educated decision. • MyMacNetbook hardware compatibility list is aimed at portable computers, listing laptops and netbooks available for retail purchase, that are compatible with Mac OS X. If you’re not technically savvy or don’t have the time to sift through specification sheets, you can choose a configuration ready-made by the great folks at kakewalk. You still have to buy and assemble the computer, but they have already chosen compatible components for three types of Hacintoshes: Lite (for web-browsing, text and spreadsheet editing, YouTube), Moderate (a solid configuration for hobby music, video, design) and Pro (a true workstation for professional creative work, and will do just fine at rendering HD videos). They also provide a piece of software (free of charge) that will automatically install Mac OS X Lion or Snow Leopard as well as all the drivers only for these specific configurations. Above, Mac OS X installing on a Lenovo laptop. MakeUseOf has a complete guide on how to build a new PC, which is available for free. Written by Karl L.Gechlik, it takes you step by step through the building process and is a great companion for this guide. 1. You need a blank CD, and burning software (for iBoot). 2. You need a retail copy of Mac OS X Snow Leopard (10.6). Note: If you download the ISO image of the operating system, you will need a DVD-9 (8GB) to burn it to. 3. For the installation process, please install no more than 4GB of RAM and only one video card. Do not connect multiple displays. Install just one hard drive, the one you want to use to install OS X. 4. Remove or disconnect USB peripherals, additional PCI cards, modems, Bluetooth dongles, WiFi cards. BIOS Setup: Follow the instructions written in the motherboard manual in order to enter the BIOS configuration utility. There we need to set the default boot device to CD-ROM and set the SATA controller to ACHI mode (it’s a standard that defines how the hard disk controller operates). If your motherboard supports it, change the HPET (High Precision Event Timer) setting to 64bit. Finally, select and enable the High-Performance (or Optimized) Defaults. Save the changes and reboot. BOOT Setup: Download and burn to a CD ImgBurn - Easy & Free CD and DVD Burner App ImgBurn - Easy & Free CD and DVD Burner App Read More with iBoot. The latest version is posted on the tonymacx86 forum. We need this software because we can’t simply use the Snow Leopard DVD to boot and install. Place the iBoot CD in the CD/ DVD-ROM and reboot your computer. At the prompt, eject iBoot and insert the Snow Leopard DVD and press F5. When the label under the DVD icon changes to Mac OS X Install, press Enter. Installation: When the installation screen appears, choose Disk Utility from Utilities in the menu at the top of the screen. Change the partition table to GUID and format the entire hard drive with Mac OS Extended Journaled; give it a name like Leopard. Close Disk Utility. Click on Install and wait while the files are being copied. Note: Dual-boot instructions are provided further into the guide. Before partitioning the disk, please consult that section. When the installation completes, restart your computer and insert the iBoot CD. Choose the Leopard disk we created earlier. Congratulations! UPDATE: Do not install updates from Apple, under any circumstances. It will break your installation 90% of the time. We need to patch the updates before installing them. • EasyBeast installs the bare minimum to allow your system to boot. • UserDSDT also does this if your motherboard is in this list. If you have a custom DSDT that’s been edited, place the file on your desktop and choose UserDSDT. If not, choose EasyBeast. Select System Utilities and install more drivers from Advanced Options. It is not necessary to check the bootloader option, it is automatically installed. There is another installation method that implies downloading an already patched version of Mac OS X from a peer to peer file sharing network. The installation process using this method only asks that you burn the obtained ISO image to a DVD and boot from it. The OS X Installation wizard is the same only that it will offer you a choice of drivers before starting to copy files to the hard drive. For legal reasons we cannot offer direct links to this software. It is possible to find this software by searching for Kalyway, iATKOS or iPC. • Put in your Windows Vista or Windows 7 installation CD and boot from it. • Use the partition tool to delete any existing partitions, and then create two partitions, at least 60GB of space for each. • Follow the instructions on screen and complete the Windows installation. • Insert a patched version of OS X (I mentioned it earlier) and boot from it. • Open Disk Utility from Utilities and format the second partition with Mac OS Extended (Journaled). • Continue with the Mac OS X installation. When it is finished, it should boot into Mac OS X. If it doesn’t, use the Windows installation disk to access the Start-up Repair option. Boot from it and choose Repair your computer. • Insert the iATKOS patched OS X install disk and select the Customize option. This will allow you to uncheck components before installation. You need to deselect everything except the Bootloader, and then proceed with the install wizard. Make sure Chameleon 2.0 only is selected. • Restart your computer and press Enter when the Apple logo appears. • You now have a dual-boot system. At each boot-up the bootloader will allow you to choose which operating system you want to start. Mac OS X is based on the Unix core which makes it one of the most stable, reliable and fast operating systems available to consumers. The user interface is in my opinion the best: it’s user friendly, intuitive, yet it has advanced features. Your Mac OS X installation comes with a suite of applications: Mail, iChat, PhotoBooth, iCal (calendar), Safari (web browser), iTunes, Address Book and a bunch of system utilities. At the bottom of the screen, you’ll notice the Dock, which contains applications and folders you access most often. You can drag and drop any folder or application you want for quick access. At the top right of the screen is the status bar, containing icons which tell you the time, WiFi connection strength, volume, etc. This is the equivalent to the Windows Taskbar. On the top left side, you’ll find the File menu, which automatically updates presenting menus specific to the application currently in the foreground. The Apple logo at the top left side of the File Menu gives you quick access to System Information, System Updates and Force Quit – the equivalent of “Task Manager” (if you ever need to close unresponsive applications). Go ahead and open up the applications in your Dock and check out the functionality each offers. If you want GarageBand, iPhoto, and iMovie you’ll need to purchase them individually from the App Store (also in the Apple menu, top left) or buy the iLife suite DVD from an Apple Store. If you ever need to change an aspect about the computer’s configuration, click on the cogs icon in the Dock to open System Preferences. To easily find the feature you wish to customize, use the search box at the top right of the window. Every item has a help entry explaining its use in very simple terms. If you want to use your Hackintosh for word processing, spreadsheets and so on, the transition couldn’t be easier. Microsoft has a version of the Office productivity suite which works on Macs, or Hackintoshes. But for a few, small interface elements, it looks just like your Windows version. Apple has its own office suite called iWork, which has the same basic features. I’ve tested it for a few weeks and I ended up switching back. After spending so much time in Word I’ve grown quite fond of it. I can personally recommend TextMate for writers and programmers alike. It’s great for writers in that it’s got a lot of functionality but it’s out of sight, leaving you to concentrate on writing. Programmers will love the automatic code wrapping and auto complete functions. FLOSS: There are a lot of applications for Macs provided by the free/libre open-source community. A categorized list can be found here. From text editing to podcasting, OpenSourceMac has an application for your needs. • GarageBand – is included in the iLife suite, which comes with every new Mac. As a Hackintosh user, you will need to purchase a copy of iLife to get this application. Simple, easy to use yet feature packed, GarageBand is the ideal way to start exploring with music creation on your Mac. • Ableton Live – is a step up from GarageBand and allows for truly professional mixing and editing. • Logic Studio – is a complete professional solution for Apple, which includes all the tools needed for music creation and publishing – it’s a complete studio – and has a very large collection of sound effects and instruments. • Pro Tools, Digital Performer, Cubase, Ardour, Tracktion – other options worth considering. • Adobe Photoshop – the Swiss army knife of photo editing tools, it gets the job done, although it comes at a hefty price. • Pixelmator – a simplified but much faster photo editing tool. • Seashore [No Longer Available] – derived from the open source Gimp, it’s a solid tool. • Corel Painter X, Acorn, Picturesque, PhotoComplete – other options worth a look. • Premiere Elements – the number one consumer video editing tool is available on the Mac. • Final Cut Pro – Apple’s own offering in this space, packs a lot of features and its signature easy to use interface. • Encore – A tool from Adobe that allows DVD movie creation with all the bells and whistles, menus, subtitles, effects. • Avid DS – the ‘daddy’ of all video editing tools, it’s incredibly sophisticated but hard to use for newcomers. A Hackintosh is never going to offer you the full experience of a Mac computer. OS X is built to integrate perfectly with the Mac hardware, allowing for features like multi-touch gestures, automatic display brightness, fast sleep/wakeup times, seamless updates for the system and drivers and more. When you’re using a Hackintosh, you lose all that integration, and instead on focusing on your work, you’re focused on keeping the system from crashing, which is acceptable behavior in the Windows/PC, but not in the Mac/Linux world. The problem with a Hackintosh is that it requires you to invest a lot of time and effort into building it, from components, to downloading modified installation disks, installing patches and so on. A main feature of OS X is that it just works and you never have to worry about system maintenance. You give that up with a Hackintosh. I’ve personally never been able to make a proper Hackintosh, one that would rival my MacBook. It’s always ends up being flaky, unreliable, and slow. And I’ve tried really hard, because in theory Hackintoshes are a great idea. I believe the extra cost of a Mac is worth it, just for the awesome customer support at Apple. No matter what problem you have with your computer, they will help you out in the shortest amount of time possible. That peace of mind is worth more than 300 dollars when your hard drive dies and you realize you didn’t back up your term paper.